According to American diplomatic parlance, the city of Jerusalem does not belong to Israel, or any country, for that matter. But when Donald Trump spoke with Israeli Prime Minister Benjamin Netanyahu on Sunday, he promised that this policy would change: Jerusalem would henceforth be recognized as the capital of Israel. As the Daily Intelligencer reports, Netanyahu has criticized a number of Trump’s proposed policies, including the full-throttle ban on Muslim immigration. Trump has not disclosed whether he and Netanyahu discussed this particular issue today. Ron Dermer, Israel’s ambassador to the U.S., and Jared Kushner, Trump’s advisor and son-in-law were also present during the 90 minute meeting. “Mr. Trump and the Prime Minister discussed the special relationship between America and Israel, and the unbreakable bond between the two countries. The topics of military assistance, security, and regional stability were addressed. 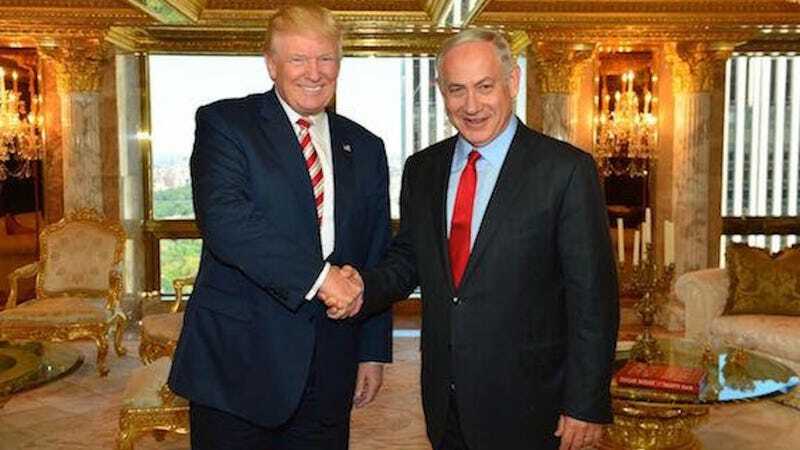 Mr. Trump agreed that the military assistance provided to Israel and missile defense cooperation with Israel are an excellent investment for America. Mr. Trump said that under a Trump administration, there will be extraordinary strategic, technological, military, and intelligence cooperation between the two countries. Mr. Trump recognized Israel as a vital partner of the United States in the global war against radical Islamic terrorism. The Palestinian people still claim East Jerusalem as their territory, and the United States embassy is located in Tel Aviv. For the last two decades Congress has attempted to relocate the embassy to Jerusalem, but the measure has been vetoed by the president in office. In 2015 the Supreme Court supported the president’s decision to keep the embassy in Tel Aviv. We can assume that Trump will attempt to implement this symbolic relocation.